FIIs were net buyers of equity on all four trading days. Their total net buying was worth Rs 71.0 Billion during the week. DIIs were net sellers on all four trading days. Their total net selling was worth Rs 45.2 Billion, as per provisional figures. According to IMF, India has been one of the fastest growing large economies in the world. Though important reforms have been implemented, more reforms are needed to sustain the growth rate. Fitch Ratings have cut India’s GDP growth forecast for FY 2019-20 to 6.8% from its previous estimate of 7% due to weaker-than-expected momentum in the economy. In a ‘Holi’day-shortened trading week, the daily bar chart pattern of Sensex continued its upward climb on the back of strong buying by FIIs. The index made back-to-back attempts (on Wed. Mar 20 and Fri. Mar 22) to breakout above the upward-sloping channel, but failed. On Friday, the index touched an intra-day high of 38565 – its highest level in more than 6 months – but closed 400 points lower on profit booking. The formation of a ‘reversal day’ bar (higher high, lower close) can trigger some consolidation or correction. Daily technical indicators are looking bullish and overbought. 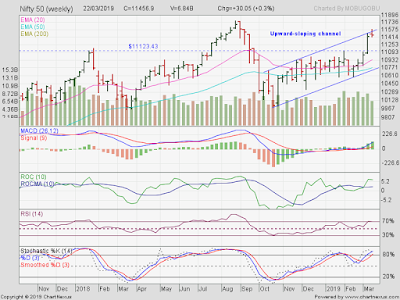 MACD is above its rising signal line in bullish zone, but its upward momentum has stalled. ROC has crossed below its rising 10 day MA inside its overbought zone, and showed negative divergence by falling during the week. RSI and Slow stochastic remain well inside their respective overbought zones. All three EMAs are rising, and the index is trading well above them in a bull market. A likely pullback – to fill the ‘gap’ zone (between 37106 and 37231) formed on Tue. 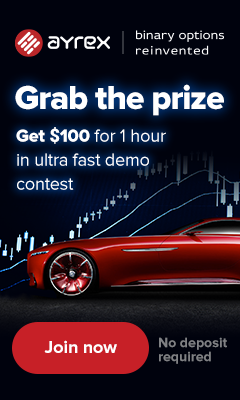 Mar 12 – can be an entry opportunity for those who missed out on the 3200 points rally from the Feb 19th low. Inventory pile-up at auto dealerships and production cuts announced by a few OEMs are clear signs that the Indian economy is slowing down. Small investors should think twice before joining the bandwagon of FII buying. Protecting profits is more important than making them. The weekly bar chart pattern of Nifty closed higher for the fifth week in a row. After breaking out above the upward-sloping channel intra-week, the index slipped down to close within the channel – forming a ‘doji’ candlestick. Weekly technical indicators are looking bullish and overbought. MACD is rising above its signal line in bullish zone. ROC is above its 10 week MA and moving sideways inside its overbought zone. 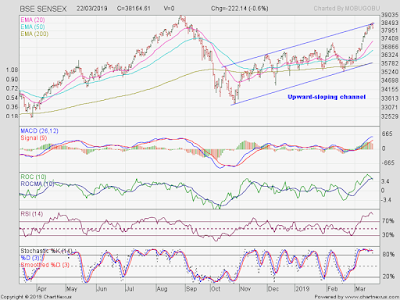 RSI is facing resistance from the edge of its overbought zone. Slow stochastic has re-entered its overbought zone. After touching a high of 28.27 on Tue. Mar 19, Nifty’s TTM P/E has slipped a bit to 28.08, which remains well above its long-term average in overbought zone. The breadth indicator NSE TRIN (not shown) is moving down towards its overbought zone. Some index consolidation or correction is likely. Bottomline? Sensex and Nifty charts are facing resistances from the upper edges of their respective upward-sloping trading channels, and are likely to consolidate or correct a little before moving up to test their lifetime highs. Dips can be used as entry opportunities.